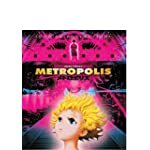 Rin Taro's Metropolis is one of those movies I go to bat for whenever the chance arises — a wide-gauge, ambitious adaptation, if a very loose one, of Osamu Tezuka's manga (which has little to do with Fritz Lang's seminal 1927 SF production save for the name and some basic ideas). Sony Pictures issued a DVD for it way the heck back when, but only now are they getting around to issuing it on Blu-ray Disc. Here's the bad news. The version being offered in the U.S. is being provided by way of Amazon's on-demand service — it's a burned BD-R, not a manufactured disc. If you want something a little more durable, you'll need to import the steelbook edition being offered to those lucky sods in the U.K. Actually, this isn't a bad time at all to buy it, what with the pound sterling being fairly low vs. the dollar. 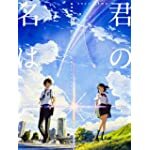 Makoto Shinkai's your name. has become such a box-office smash that it's unseated Spirited Away for the all-time top grossing anime release, having mobbed some $192 million in Japan alone, with another $81 million in China. It's set to debut in the U.S. on April 7, although most likely only in a limited release that will not bring in anywhere nearly the kind of cash it's seen back at home. What little I've seen or heard about Sunao Katabuchi's lilting life-during-wartime drama In This Corner Of The World has been highly appealing. Add to that this news: Japanese cinema institution Kinema Junpo recently named it the best Japanese film of 2016. Not best animated film; best film, period. My one bit of trepidation about this production revolves around Katabuchi's previous film, Mai Mai Miracle. I wanted to like it — it's got the same kind of "ah, nostalgia!" atmosphere that In This Corner appears to be also exuding — but its story was too fragmented, aimless, and poorly paced for me to really get behind it. I hope Corner delivers where that film stumbled. Perhaps the most startling thing about both movies was that they came from the same man who directed Black Lagoon. What can I say? He's large; he contains multitudes. Good for us. Hiroaki Samura is best known for Blade of the Immortal, as fine a piece of comics work as you're going to find in any language. 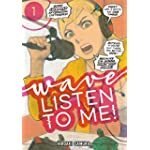 It's easy to assume Blade is representative of his work as a whole, but that's not true, and a new title of his from Kodansha titled Wave, Listen To Me! looks like it'll be a fine way to learn more about that. Who would have thought the creator of an immortal outlaw swordsman would give us a story about a woman breaking (literally) into talk radio? I wasn't as fond as I wanted to be with Die Wergelder (what I've seen of it so far, anyway) so this looks like a nice change-up in the vein of his amusing short stories set in the present day. people: Amazon people: Hiroaki Samura people: Makoto Shinkai people: Osamu Tezuka people: Rin Taro people: Sunao Katabuchi title: In This Corner Of The World title: Metropolis title: your name.